Stopping by Whole Foods for lunch (or on the way home) can be a little daunting. 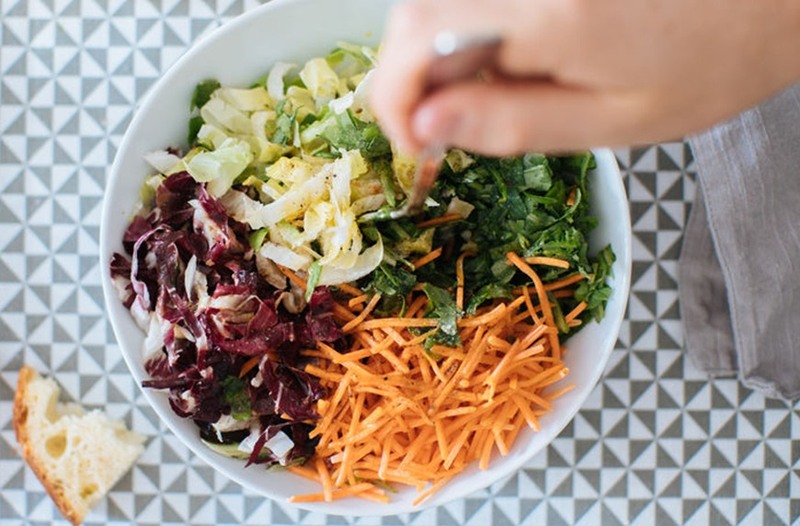 With a salad bar overflowing with healthy options, it’s hard to know exactly how to build your bowl to get the most bang for your buck—but one celebrity nutritionist has figured out the perfect formula to help you conquer mealtime like a total pro. Kelly LeVeque, founder of Be Well by Kelly and nutritionist to stars like Jessica Alba and Emmy Rossum, is an expert at making body-benefiting choices at the salad bar—even when she’s surrounded by a mob of rushed (and super-hungry!) people. In a recent Instagram post, she revealed her exact strategy, and yep: The first step is going straight to those vitamin-packed leaves. “Build a base of greens! Add arugula—it’s a cruciferous vegetable that provides sulforaphane, an anti-cancer, detoxification, and anti-inflammatory powerhouse,” she says. Choosing options packed with water—like cucumbers, zucchini, bell peppers, and broccoli—is a must if you want to stay nice and hydrated throughout the day. After making your bowl look like a straight-up rainbow, it’s time to grab some protein, whether that’s plant- or animal-based. “I normally go for the hot bar chicken first if it’s available because I like the taste. For me, it’s about being satisfied,” LeVeque says. “Otherwise I’ll add in pumpkin and/or sunflower seeds, or maybe a hard-boiled egg or beans.” Then for healthy fats, that’s where your dressing comes in: Take some extra-virgin olive oil and add in some apple cider vinegar, salt, pepper, and “whatever fun spices they have, like cayenne or turmeric,” she says. “Spices are extremely high in phytochemicals.” If they have baba ganoush on hand, she recommends mixing a dollop of that into your dressing too for even more flavor. See? Making your way through the Whole Foods salad bar isn’t so hard after all. With these smart tricks up your sleeve, you’ll always be able to put together a meal that’s all sorts of healthy—even when someone’s breathing down your neck as you’re trying to pick out the perfect broccoli florets. Here’s how to sprinkle nutritional magic on everything from salad to popcorn. Or, find out how you might have been prepping salad wrong your whole life.